I have a deep question for you to ponder today. Why is bacon not a more popular Thanksgiving stuffing ingredient? I’ve had stuffings with scallops, and others with water chestnuts. I’ve also had many made with sausage, which are delicious. But until a few nights ago, I’d never had a stuffing made with bacon. When I realized this on Monday night, I had to act immediately. Bacon is high on my food pyramid, and I just couldn’t believe that I’d never coupled it with bread enriched with turkey drippings. To add a little more flavor, and not get too crazy with the bacon, I threw in some dried cranberries and diced apple. The stuffing was freaking unbelievable. To take the picture above, I had to scrape the bottom of the covered dish for scraps and beat my husband back with a wooden spoon to keep him from eating it. So this Thanksgiving, I invite you to rectify this great injustice. Reach for the bacon for your stuffings. Go ahead, join me. If bacon is the hot new chocolate flavor, odds are pretty good that bacon stuffing will be the hot new trend of 2010 Thanksgiving. Here’s your opportunity to be a trendsetter and have a delicious stuffing. Prepare the stuffing according to package directions. In a large frying pan, cook the bacon over medium heat. When the bacon is lightly browned, add the apples and cranberries. Saute for 2 to 3 minutes, until the apples begin to soften, and add 3/4 cups of chicken stock. Scrape up the bottom to get all the browned bacon bits. Pour the bacon, stock, and fruit into the cooked and fluffed stuffing. Mix well together. Place the mixture in an oven proof dish with a cover. Cover and cook at 375 degrees Fahrenheit for 30 minutes. Enjoy immediately on turkey or chicken. >i hate stuffing, but that sounds kind of good. Thanks for the link Robyn! I absolutely adore stuffing. Cannot get enough. 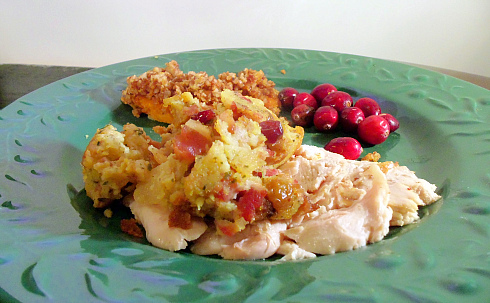 And who can go wrong with apples and bacon in stuffing? Can these be made into stuffing balls?